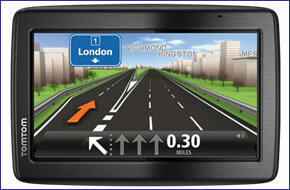 TomTom Via 135 car sat nav provides street-level navigation via a 5-inch touchscreen display. What's more it speaks street names, has advanced lane guidance and provides optional speed camera warnings. TomTom Via 135 is voice controlled and Bluetooth compatible. There is also a points of interest database including locations such as petrol stations, restaurants and hotels. The Via 135 sat nav is equipped with IQ routes which will calculate the shortest, most economical route. Two versions of the TomTom Via 135 with different preloaded maps are available, these are UK and Ireland and European maps. TomTom Via 135 has been discontinued. TomTom Via 135 is the mid-range in-car sat nav from TomTom. The TomTom Via 135 features a 5-inch touch screen and there are two mapping versions of the TomTom Via 135. The Via 135 UK and Ireland comes preloaded with maps of UK and Ireland and the Via 135 Europe is preloaded with maps of Europe including 45 European countries. It also has a QuickGPSfix making connection to satellites very quick. The TomTom 135 provides spoken street names making turn by turn navigation easier to interpret. advanced lane guidance provides 3D images of junctions and this TomTom satnav also provides speed cameras warnings. You will also receive alerts when you are speeding using the speed alert feature on the TomTom Via 135. The TomTom Via 135 features hands free navigation. Simply speak instructions to your TomTom sat nav and it will operate to your voice commands. The TomTom 135 is also Bluetooth compatible enabling hands free calling. The TomTom Via 135 includes IQ routes which will calculate the fastest routes and accurate arrival times. When you arrive at your destination you can use the parking assist feature to find the nearest parking locations. Furthermore TomTom’s Points of Interest database includes petrol stations, hotels and restaurants. TomTom Via 135 get's it speed camera data from Road Angel a leading UK speed camera detector manufacturer. The Via 135 sat nav also alerts you when you’re speeding, even if you're not in navigation mode. ‣Pre-installed United Kingdom and Republic of Ireland maps or European maps depending on version purchased. TomTom Via 135 has been designed to be a portable plug and play device, and as such can be transferred from vehicle to vehicle with ease by the user. TomTom Via 135 is powered with a 12-volt Compact Car Charger (supplied) and attaches to your vehicles windscreen via the TomTom Via 135 Integrated Mount which is also included. TomTom Via 135 car navigator is available either preloaded with UK and Ireland maps or with European maps (45 countries). Both versions of the Via 135 are available to buy from this product page by clicking the relevant 'add to basket' option above. TomTom Via LIVE 135 Europe version (Product code: TVL135E) includes street-level road maps for the following 45 countries in Europe.